Order early from Grandpa’s Orchard™ to get the best variety choice. 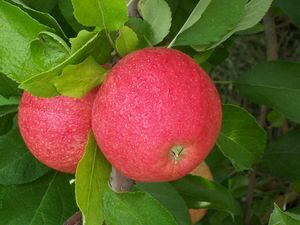 Don’t wait until March or April to order your fruit trees. The hot varieties go first, and Grandpa might not be able to get more. The best varieties sell out first! Grandpa has been in the nursery and fruit business for many years, and it still amazes him when people want to order trees as though they were “widgets” built in a factory! Did you realize that it takes almost two years to grow a tree for Grandpa’s Orchard™? Grandpa and his nursery friends have to plan a long ways ahead to grow the “right” amount of the “right” variety on the “right” rootstock, hoping that they made the “right” projection and would be able to sell most of them a couple seasons hence! Grandpa may be smart, but he’s not “right” all the time! Certain varieties on certain rootstocks have been in short supply for several years. Sweet cherries on the “dwarfing” and early bearing Gisela® rootstocks are the hottest item on the market right now. While we have a certain amount, we probably won’t be able to get more if lots of orders come in and we sell out. Pears are another item in short supply. The same thing holds true for many varieties of all the other types of fruit too, in some way or another. We don’t like telling customers that we can’t supply the varieties they want because they ordered too late. So, Grandpa recommends that you plan ahead and order early. The old cliché that “the early bird gets the worm” is very true in the nursery industry. When all the worms are gone, then the bird goes hungry! Usually, when we get into late March and early April, things are really tightening up. When May comes, then you only get to choose from the ‘leftovers”! Please order early! you tell us to order early. just when is this time. I cant order for fall, so it must be spring. please let me know, because if you will not have what I need, then I need to make arrangements to order elsewhere. thank you. Sorry, this comment was buried. Today is actually the last day to order for spring planting. However, so far, we are planning on having a fall shipping season this year. Just don’t have the details on that yet. Thanks for your comment! ← Snowy winter days are a good time to plan for Spring.